Photograph o Battleship Row taken frae a Japanese plane at the beginnin o the attack. The explosion in the center is a torpedo strike on USS West Virginia. Twa attackin Japanese planes can be seen: ane ower USS Neosho an ane ower the Naval Yard. U.S. declaration o war on the Empire o Japan. Germany an Italy declare war on the Unitit States. Unitit States declares war on Germany. Unitit States declares war on Italy. 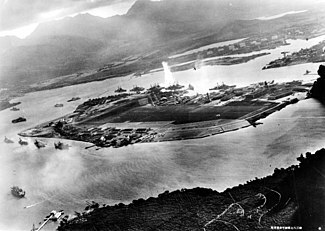 The attack on Pearl Harbor, an aa kent as the Battle o Pearl Harbor, the Hawaii Operation or Operation AI bi the Japanese Imperial General Heidquarters, an Operation Z during plannin, wis a surprise militar strike bi the Imperial Japanese Navy against the Unitit States naval base at Pearl Harbor, in the Unitit States Territory o Hawaii, on the mornin o December 7, 1941. The attack led tae the Unitit States' entry intae Warld War II. ↑ Unless itherwise statit, aw vessels leetit war salvageable. ↑ "Ships and District Craft Present at Pearl Harbor, 0800 7 December 1941 US Navy Historical Center". History.navy.mil. Archived frae the oreeginal on July 10, 2011. Retrieved July 5, 2015. ↑ "Overview of The Pearl Harbor Attack, 7 December 1941". Retrieved October 5, 2014. This page wis last eeditit on 31 Januar 2016, at 00:39.